Chris Fleming, medium, paranormal researcher, television personality, and public speaker. Check out Chris’s Unknown Magazine, Spirit Talk Podcasts, and Ghost Outlet store! ghostvilliage.com Ghosts - research, evidence, and discussion. 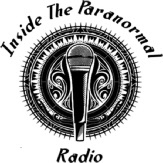 Ghosts, UFO's, Cryptids, Psychics, Mediums, and much more. Listen live or to downloads on blogtalk radio, or live on Friday nights at 8 p.m. on 95.7 FM if you’re in the Cincinnati area!